How do you enjoy a jazz festival – or any type of festival for that matter? I guess different individuals with different personalities have their different preferences and strategies, and I have mine. Although there usually is an enormous supply of music listening opportunities at a jazz festival I go for selectiveness. Not because there is only a few good musicians there – that is never the fact – but because I have my limits in terms of enjoying music. An important part of my enjoyment takes place in my memories and remaining feelings after the concerts – and too many concerts blur my memory and my feelings. A multitude of concerts (including the ones I pass by on the street) therefor diminish my experience of each one of the concerts. The reason why I go to a specific festival is normally that an artist who is special to me will perform there. The first time we went to Molde Jazz Festival in Norway was because of Melody Gardot, who was new to Scandinavians by the time. The second time in Molde our main attraction was Kurt Elling. We went to Ystad Jazz Festival when Hiromi Uehara performed in Sweden for the first time, and to Stuttgart and Juan-les-Pins because of Diana Krall, etc. Once at the festival we of course enjoy some other musicians as well, but only a few. 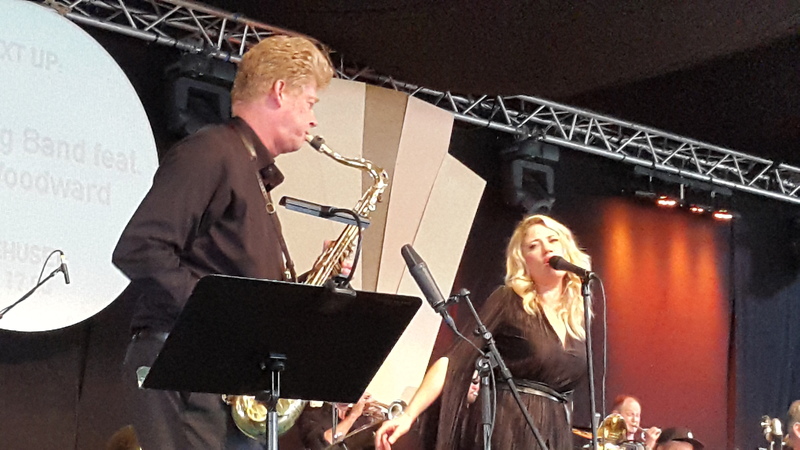 The reason we decided to come to Aarhus Jazz Festival in Denmark this year was Lucy Woodward. 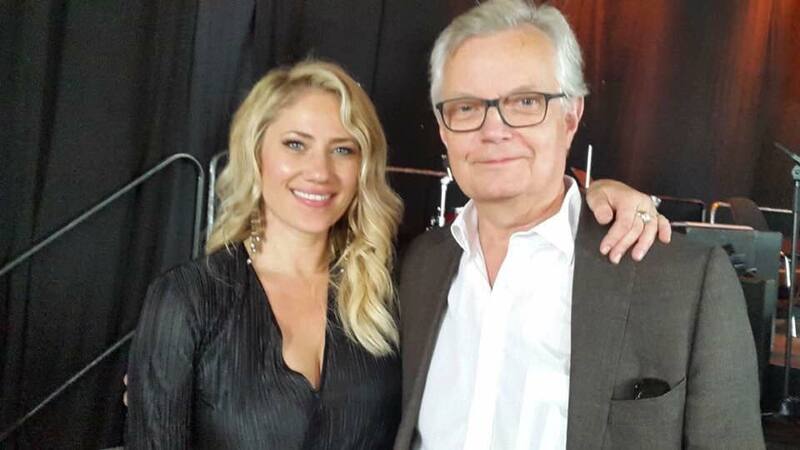 I discovered Lucy on YouTube in February 2014 and I have told the story about this very personal, all-round and truly professional singer before at Musik.pm. It is also a story of how I unsuccessfully have tried to see her perform live several times. For the full story and some very nice music videos follow this link! So when I learned that Lucy was coming to Aarhus, I wanted to give it a new try – and this time I was successful! My wife and I came to Aarhus on Tuesday 18 July, in good time to find our way around in Aarhus before Lucy’s concert the next day together with the TipToe Big Band, a band from Odense in Denmark. The collaboration is new, and I had not heard Lucy sing with a big jazz band before. Her collaboration with the funk-fusion band Snarky Puppy is not quite the same. But I thought that the dynamics of a big jazz band might suit Lucy´s temperament, expression and vocal resources very well. And so it did! The concert was in my view a big success for the combination of the band and Lucy. I loved the forceful and swinging music they executed together. Although already being all round musicians they both probably added new dimensions to their usual expressions. If Lucy wants to carry on with this type of collaborations, the big bands can queue up. And then we experienced Lars Jansson Trio in a very enjoyable performance – Lars on piano, Peter Vuust on bass and Lars’ son Paul Svanberg on drums. The only problem with that concert was that it came to an end far too quickly. Not because the concert was short – it was standard format – rather it was so pleasant that you did not notice time. The music was beautiful in a relaxed way, and Lars Jansson is a fun person full of positive charisma and humour on stage. So we visited three very different concerts, all three very enjoyable, and that was it. After all, we only stayed two days. I am sure most visitors stayed longer (or live in Aarhus), and enjoyed many more concerts. As music lovers we have different agendas, preferences, capacities and strategies. If you go to a jazz festival you usually stay a couple of days or maybe a full week. This means that there has to be something more than music to enjoy, not least if you want to be selective in your attendance of concerts. Aarhus is indeed a very nice city to host a festival. Big enough to have lots of nice restaurants and pubs, good hotels, nice parks and shops – but small enough to give a feeling of nearness and intimacy. The venues are located close to the centre of the city, which means that you can cover most of them strolling around on a nice summer evening walk. During the festival week the festival colours the feeling of the city, but it does not dominate it. Ordinary city life and the festival co-exist in harmony and with a very nice balance. We fully enjoyed our days in Aarhus! Found Lucy at last – at Aarhus Jazz Festival!